The first day of spring was March 20th and the future park site is in full bloom! We have had the pleasure of watching the various species of plant life come alive from the recent rains and changing of seasons, reminding us all of what a beautiful park this will be. If you have not yet noticed, the Francisco Park Conservancy has a new website, just launched this month! Please take a moment to look through our site. 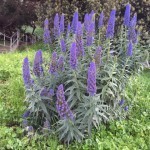 Echium candicans: This plant produces spikes of blue-purple flowers and is commonly found along the central and south coast of California and the San Francisco Bay region. It is known to survive in poor soil with little water, and is very popular amongst the butterfly, bee and hummingbird community. 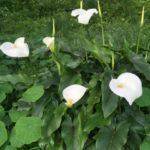 Zantedeschia aethiopica (Arum lilies or Calla lilies): This species is native to southern Africa and has naturalized along the Northern California coast. They enjoy seasonally damp places and bloom from early spring to mid summer. Natural grasses and sporadic wildflowers can be found along the hillside of the future park site. These small birds are common house sparrows who live in urban settings and feed mostly on seeds. 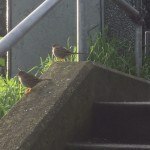 Here they are enjoying the early morning sun on the Larkin Street steps of the future park site. 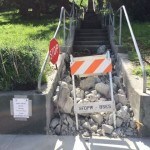 The stairs along Bay Street are currently under repair by the Department of Public Works (DPW). The first ten steps have been jackhammered and replaced, due to uneven step surfaces. 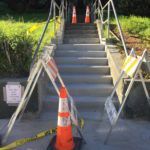 The stairs will be closed until April 1, 2016. 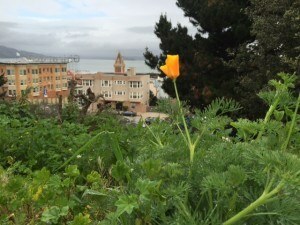 “Green Connections” is a program implemented by the City and County of San Francisco Planning Department in an effort to increase access to parks, open spaces and the waterfront. The network of ‘green connectors’ are city streets that will be upgraded incrementally over the next 20 years to make it safer and more enjoyable to travel to parks by walking, biking, and other forms of active transportation. 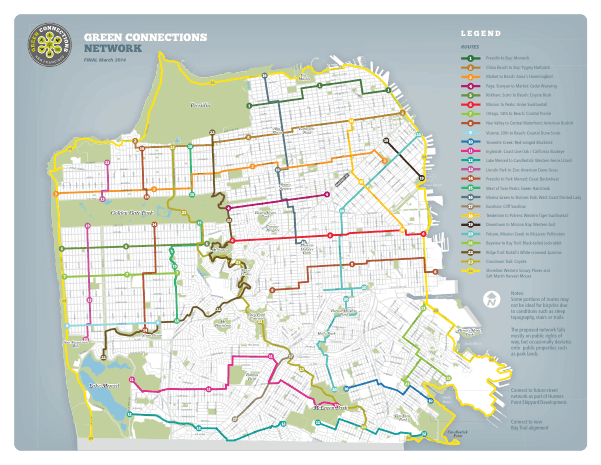 With 24 recognized “Green Connections” throughout the city of San Francisco, “Green Connection #1” runs directly through the future Francisco Park site. Route #1 runs from the Embarcadero and Filbert Streets to Lyon and Greenwich, passing by Coit Tower, Washington Square Park and Fort Mason on the way. On March 19th a “Bio-Blitz” was conducted for Green Connection #1. A Bio-Blitz is a one-day study of biodiversity in a specific location, conducted by both scientists and volunteer citizen-scientists. 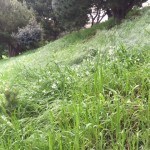 The Green Connection #1 corridor has been noted as prime habitat potential for the highly charismatic Monarch Butterfly species, which can be found making their way into San Francisco beginning in the late summer and early fall when they are migrating southward. To learn more about the findings of the bio-blitz in Connection #1, click here. To learn more about upcoming bio-blitzes and citizen science events, click here. A product of the Green Connections project is the “Ecology Guides” – a tool for visitors, surrounding neighbors, designers and gardeners who want to learn about the different species and eco systems found along the 24 various routes. To learn more about the Green Connections program and view the “Green Connections Ecology Guides” please click here. Thank you for your continued interest in this aspirational community park project.